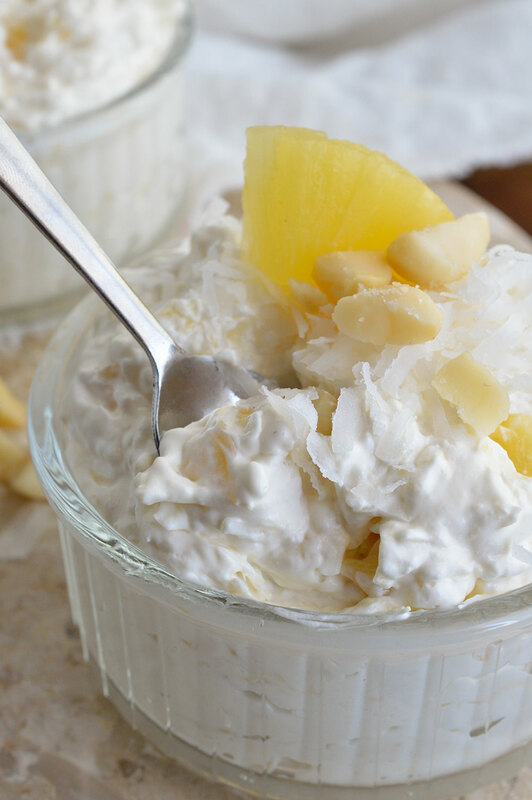 This Coconut Pineapple Fluff Recipe is light, airy and full of flavor! Coconut and Pineapple whipped with cream cheese and Cool Whip then topped with macadamia nuts. Serve straight from the bowl or as a dessert dip. For anyone that follows me on Instagram, you already know that I was recently on a Hawaiian vacation. I shared a lot of tasty food and beach pics. I’ll be sharing a little more about my trip along with some Hawaii inspired recipes. You can check out a couple vacation photos below this recipe. Hawaii is obviously known for it’s pineapple. In fact, I was supposed to take a tour of the Dole Plantation but that didn’t end up happening. I was super bummed because that was what I was looking forward to most. Hey, I’m a food blogger. I’m interested in food! 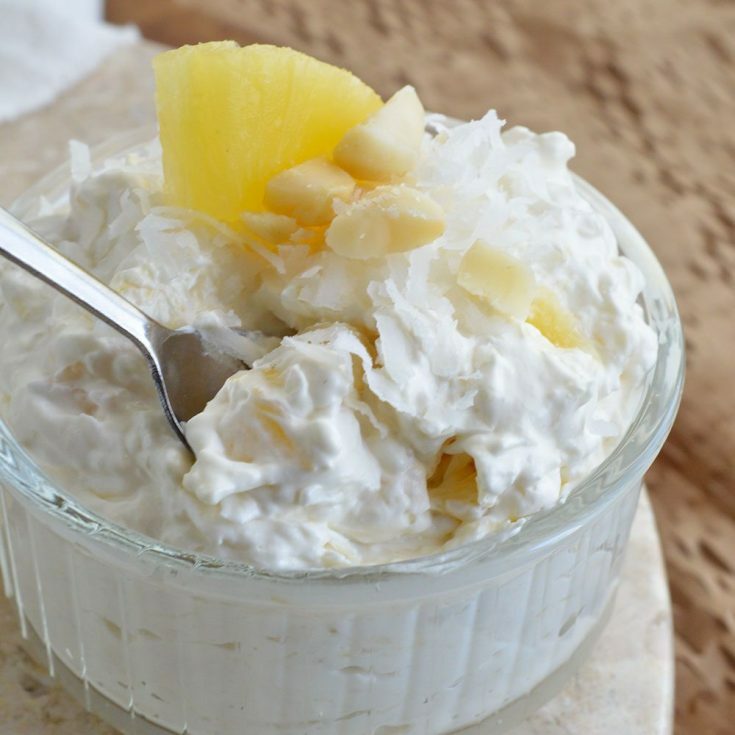 This Coconut Pineapple Fluff Recipe is quick, easy and delicious! It comes together in just minutes. Eat it straight from the bowl of serve a dessert dip. Guaranteed crowd pleaser! Completely drain pineapple in a mesh strainer. Push out all liquid using the back of a spoon. Using a hand mixer; mix Cool Whip and cream cheese until smooth. Add pineapple, vanilla and coconut flakes. Serve topped with coconut flakes, chopped macadamia nuts and a pineapple wedge. 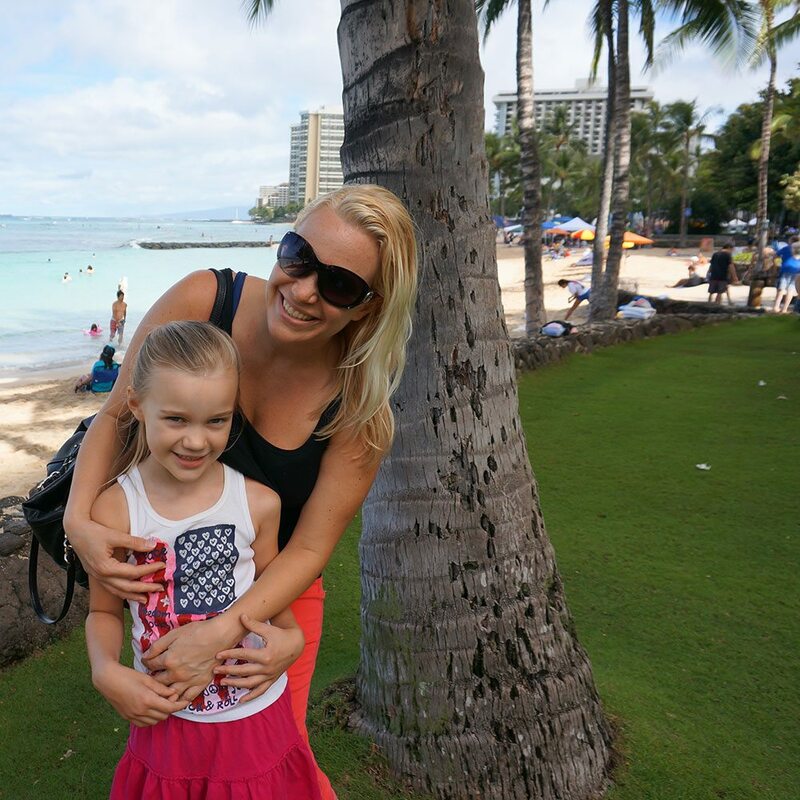 Here I am with my mini me on Waikiki Beach. We were taking a stroll, heading to the Honolulu Zoo. I’ll share pics from the zoo trip on a later post. We had so much fun at the zoo that it deserves it’s own post. One thing I kind of expected but wasn’t fully prepared for was the color in Hawaii. The colors are so vibrant. The blues are bluer, the greens are greener, the pinks are . . .well, you get my point. 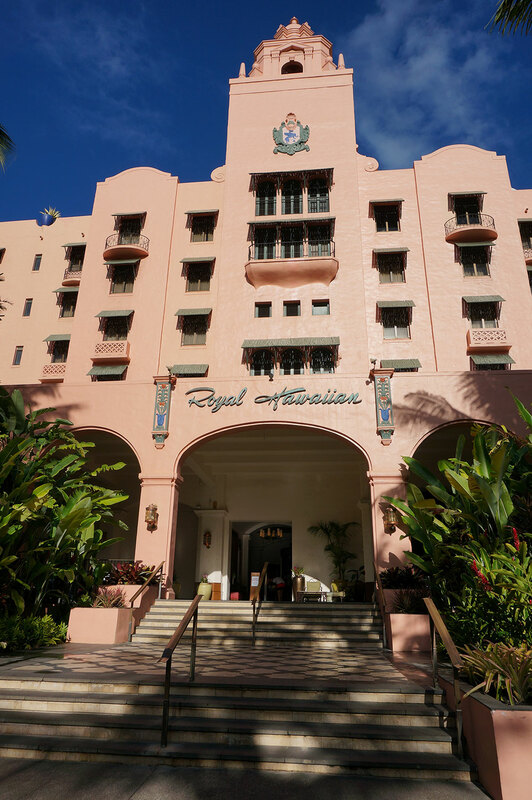 We stayed at the Royal Hawaiian on Waikiki Beach. It is a gorgeous hotel with shops, restaurants and pools. Waikiki Beach is literally right outside the doors. I stayed in the Mailani Tower, which includes even more perks. There are complimentary breakfasts, appetizers and cocktails. Plus the rooms have balconies. This is the view from my balcony. I know, pinch me! It was gorgeous. I loved sitting out on the balcony early in the morning while I enjoyed my coffee. Perfection. There were shops, restaurants and shows right next to the Royal Hawaiian. 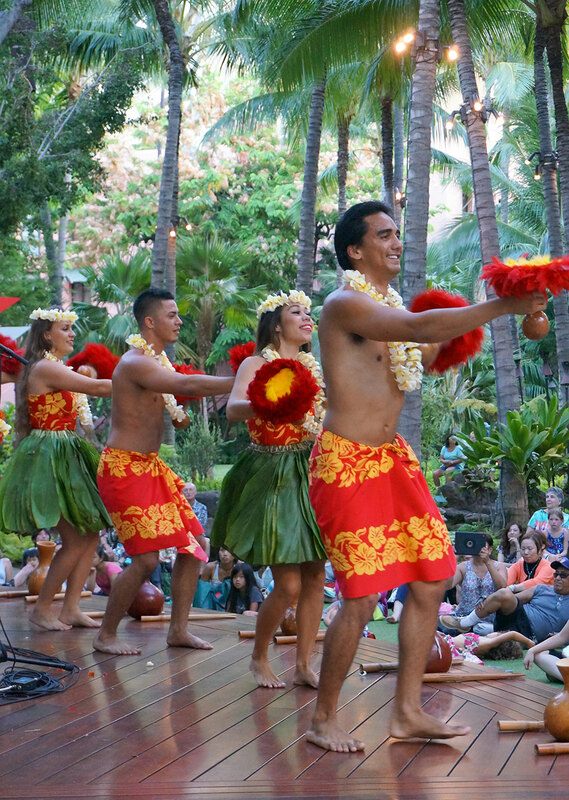 This photo was taken during a traditional Hawaiian dance show. Me and the kiddo enjoyed the show while digging into some shave ice. Our favorite treat! 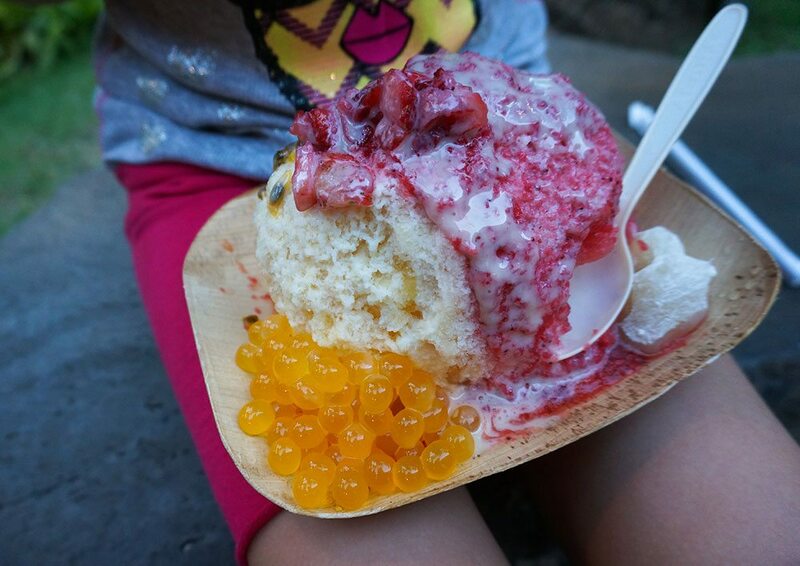 Shave ice with boba and mochi . . . So Good. That alone was worth a five hour flight! Stay tuned for more about our Hawaiian adventure. . . Thanks! It was quite a view. I couldn’t get enough pineapple after my first trip to Hawaii either. Looks like you had a fabulous time! When necessary I drain canned fruits and then place the fruit on layers of paper towels to finish wicking out the excess liquid. want to make this for a bbq today – how many does this serve? Might have to double it for a dozen people or so???? Pls answer awap. Thank u!! U can fb me at Beth Green Hoffer or email or comment on the recipe post. Wowza, well first, I loved your blog name, Wonky Wonderful, tee hee. Then, I loved your delicious looking recipe. 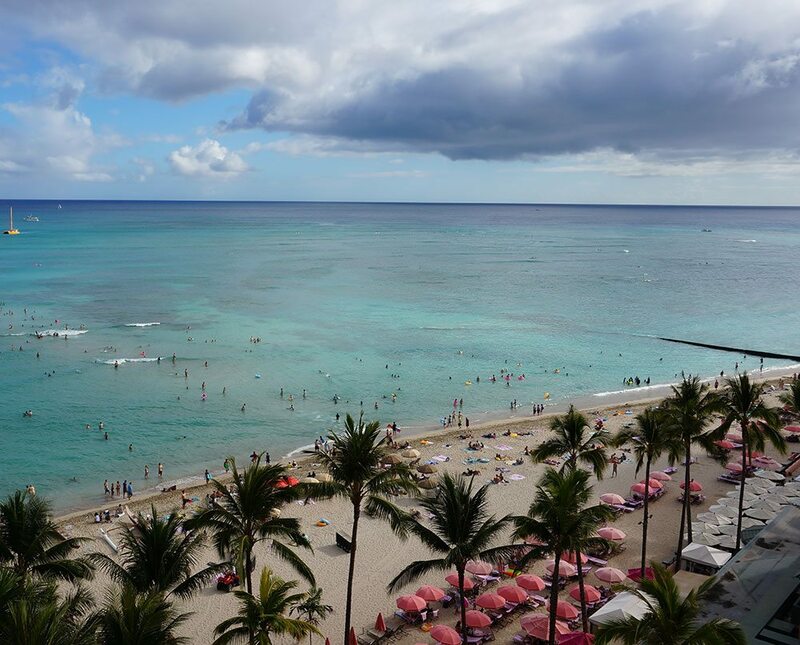 Finally, I loved your posts from Waikiki! I used to live right by the zoo and I miss it a lot (as you may be able to understand), your pictures brought me great joy! Thank you for sharing, and keep up the fabulous work! P.S., I will be sending you an email..